Last night in LotRO, I was questing along through the Misty Mountains. It’s a really pretty zone, I love how the intensity of the snow storms change from place to place, and you get to fight your first Nazgûl (not to mention there’s an undead dragon there, which I’ve always thought felt way more out of place in Middle Earth than the Rune Keeper, but what do I know). It was all going well until I got the breadcrumb quest to go to the Northern High Pass. That’s when I got completely, frustratingly lost. The Misty Mountains is one of those zones that I only vaguely remember because I’ve only completed it once, and mostly what I remember is not being able to get anywhere without running half way across the zone to get around a mountain peak. 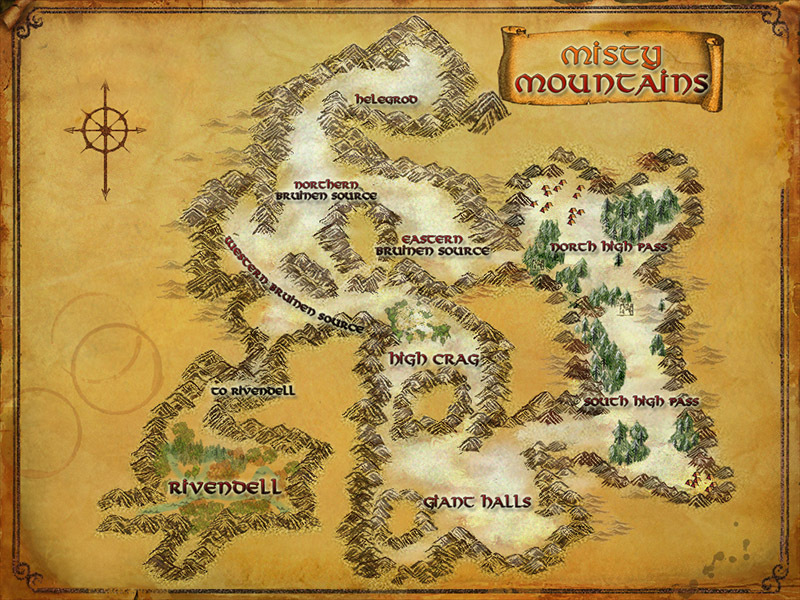 The fact that there will be a few zones that are just plain annoying to get around in is pretty much a given for any MMO, especially an older one, but the problem is severely aggravated by the fact that LotRO’s map, pictured above, is just about useless for navigating. They’re a nice idea–make the game map look like a hand drawn parchment map (complete with coffee mug stains; someone really should take better care of the zone maps) that seems at home in the Tolkien universe–but they really need an option for something with some more fine detail. Back in the day there used to be a Google Maps styled map in the lore book that would allow you to zoom in from the parchment map to the actual terrain map, but alas, the lore book is no more and if that map still exists I can’t find it. So I wandered around near the final E in Eastern Bruinen Source for a good fifteen minutes, running into several goblin villages and such, but not finding the way to the High Pass. Finally I gave up there and thought I’d try finding my way through the Giant Halls up through the South High Pass. The Giant Halls is a big chunk of the zone that’s designed for groups, but with the Beorning’s heal over time and generally good survivability (and a little luck), I’m usually able to solo my way through such areas as long as I don’t pick up more than one or two things at once (and as long as I’m not in a hurry). I slogged my way through this area, but all I ended up was finding in the area that appears on the map to connect to the high pass was some kind of town full of giants, which, as you can imagine, proved to be too much for my self healing abilities. Some day I’ll have to come back here with a friend and clear things out, but I then decided to turn my attention back to the north and see if I could find the pass I was looking for. After another half hour or so I finally found it, but by that point is was getting late and I decided to call it a night. After a little research, I ended up finding this plugin which gives terrain maps (from the minimap), but no labels, and isn’t terribly user friendly. It’s better than nothing, but I still don’t understand why something like this isn’t built into the game itself. Crappy maps are one of the fastest way to frustrate your players, and frustrated players aren’t paying players. I often had the opposite problem with SWTOR’s schematic styled maps; they had so many details on them it was often hard to tell what was a door and what was just some bit of decoration or debris they decided to include on the map for some reason. Picking through the wreckage of Taris was the worst for this, especially since it came before speeders for Republic players. No map is going to accurately portray every bit of the zone, especially as zone designs seem to be trending toward more and more vertical space (Guild Wars 2, I’m looking at you), but it seems like certain developers were more interested in graphical style than functionality. You know what, though? I actually still ended up having fun that night. Soloing areas designated for groups is one of the guilty pleasures that makes me love healing-tank classes. And as frustrated as I was with the map, at least most of the enemies are pretty spread out and easily avoided. I was also able to complete a few quests while searching everywhere for the path to another. Anyways, thanks for reading my rant. I’ll be tackling Goblin Town next, which I’ve heard means more frustration. I think I may have missed (skipped?) it entirely last time around, so we’ll see.